At the time, my father was a young Squadron Leader in the Indian Air Force (IAF). He had just been transferred to Wellington, a self-contained military establishment 14km from Ooty. He had been selected for the prestigious Defence Services Staff College course—a competitive programme of international repute for which over 400 officers from the air force, army and navy are taken after a written examination. All our belongings, including our trusted friend—a handsome, blue-grey Chetak scooter—had been sent to our new home on a truck. We were to leave in the next few days by a “special train". Now the sudden addition of an old Maruti 800 to our humble family posed all sorts of questions. Surely cars weren’t allowed on special trains? What would happen to the scooter? Who was going to drive this strange-looking machine? 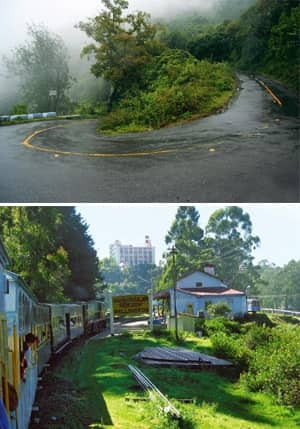 On the curve: (top) There are more than 28 narrow hairpin bends on the drive up (by Chris Stevenson); and the toy train, or Nilgiri Mountain Railway, pulls into Wellington station (Jyoti Prakash Bhattacharjee). The route from Bangalore to Wellington is an adventurous one. My father had probably envisioned that after many years of travelling on the aforementioned scooter, the four of us would be immune to any difficult travel paths. But sitting snug in our new car, we were still taken aback by this particular path—we were introduced to the wonderful world of hairpin bends. Our route contained 28 of them. Alternating between fear and awe, we spent most of our time with our heads held as close to the car window as possible, staring at the rich green landscape around. We didn’t realize it then, as my father adeptly navigated his way through one precarious curve after the other, but that thrilling first car ride triggered a tradition of several other unique little family holidays; in varied and at times obscure locations across the world, but somehow always centred on a car. When we arrived and drove through the campus, we found that all the houses had pretty names like Westgrove Castle and Strawberry Cottage. As my father had quite a senior rank, we would be staying in one of the nicer houses—a stone-built, duplex bungalow called Wellington Hall. For the less fortunate, there was Gourka Hill, a place full of custom-made and identical flats. The more junior the officer, the higher he had to trudge to his quarters. It was all colonial and civilized. We soon realized this was going to be a quiet, 10-month vacation in a place right out of some fantastic British history book. Wellington was managed entirely by the military forces and the authorities enforced a strict zero-garbage rule, charging heavy fines for even a strip of paper on the road. This seemed to result in all its inhabitants treating it like their own home, making a conscious effort to keep it spotlessly clean. One of the activities for officers’ wives was a course on baking and I remember a happy few weeks when my mother would come back home with the products of her toil—an exotic-looking cake or a delectable pastry. My mother has always been a generous hostess and her new baking skills only accentuated this quality. We had several visitors in our time in Wellington and our old, round oven was nearly driven into early retirement after each one of those visitors was rewarded with an unusual cake of top quality. School excepted, my brother and I had no pressing matters to attend to, and we were free to explore the brilliant experiences that Wellington provided. Every evening, a young man would walk a pony around the campus, and for a small amount, we could buy ourselves a pony ride. Eventually, my brother and I got better and the man allowed us to progress from a “trot" to an impressive “canter" close to the edge of the hills. There were also organized hikes and trips to explore the places around—lakes untouched by the public and mountain trails that treated us to fresh views of the hills. My personal favourite activity was to take walks around the campus, discovering new and interesting territory, unmarked by any adult-like forces. One of the main consequences of being perched up on the hills was that even simple things would take a different twist. We would rush to play in the park because sitting on the swings, you felt as though you were dipping in and out of gorgeous landscape that you had taken possession of a long time ago. We felt like the park, the hills, the trees, were all a large playground that we loved and took for granted. This perspective made us braver in our games and it wasn’t unusual for us to go wandering off in search of an imaginary quicksand pit or a haunted temple. Another fascinating facet of a place neck deep in colonial history was discovering things like discarded golf courses. For a child, it was like finding a secret private island, and armed with packed lunches and snacks, I guided a select set of members from my enormous social circle to our own equivalent of an Enid Blyton adventure. Wellington lacked a good public transport system and as much as I liked walking by myself, I also loved to go out exploring with my family. For us, having a car soon became irreplaceable. When my father wasn’t busy, we took our old Maruti to tea gardens, breathtaking view points, toy-train stations, and old run-down theatres. Wherever we went, we ensured we experienced the place in a way that was personal and uninfluenced by maps, guides or travelogues. When we left Wellington, I think we all cried a little. We did return a few years later, this time in a different car. My father was out of the IAF and we stayed at the Wellington Gymkhana Club, an ex-garrison club meant for the recreation of officers. For two days, we managed to almost duplicate the Wellington staff college experience. We immersed ourselves in our old life, wandering about in the hills, watching the Nilgiris change colour as the day progressed. Technically, there isn’t much to “see" in Wellington. It’s the sort of place where you stumble upon hidden and beautiful spaces while maintaining a belief that there is an endless supply of those spaces. As we drove away for the second time, it was as though the hills watched us, non-judgemental, understanding that we would come and go as we pleased, but they would remain, storing our memories and time itself, ready to welcome us— and our car—back if we liked.